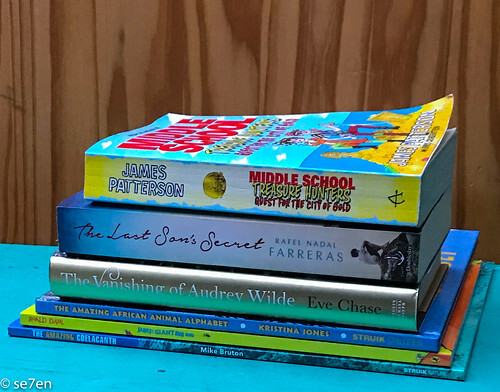 In this post I am letting you know about a couple of the latest and greatest kids reads from Penguin Random House South Africa and Struik Nature, and if you are looking for something to escape into this weekend for yourself, then scroll on down for a historical saga and a time-hopping mystery. 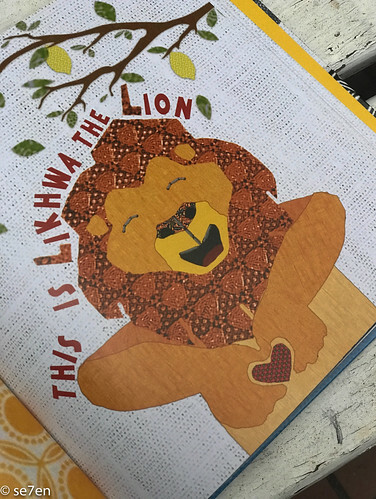 The Amazing African Animal Alphabet written and illustrated by Kristina Jones: Oh my heart, what a delightful book, a very fun twist on an age-old theme. Collage illustrations, from lovely to look at Shweshwe fabrics. Each letter of the alphabet has an animal and a couple of little letter features on each page… oranges on the O-page and zippers on the Z-page. 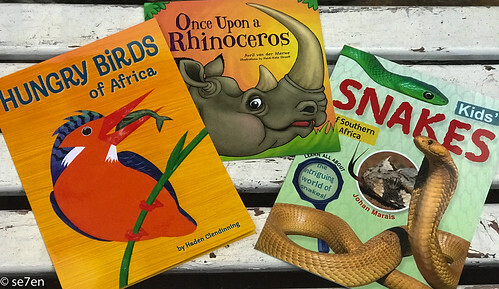 The animals are wonderfully engaging and relatable beasts and each one has their own, very typically South African name. 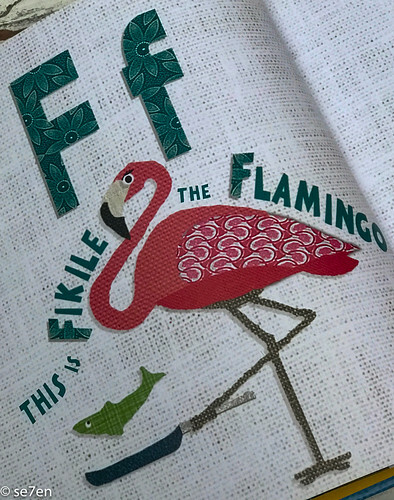 There is Fikile the Flamingo, Gugu the Giraffe and of course Zandile the Zebra. This book is extremely giftable and makes the perfect gift to send overseas. Roald Dahl’s James’s Giant Bug Book: This book is just brilliant, in the true team spirit of Roald Dahl and Quentin Blake, this book is just the best fun and of course ties in with one of the favourite of all Roald Dahl’s books: James and the Giant Peach. Twenty insects are examined in detail, from ants to stick insects, snails to lady bugs. 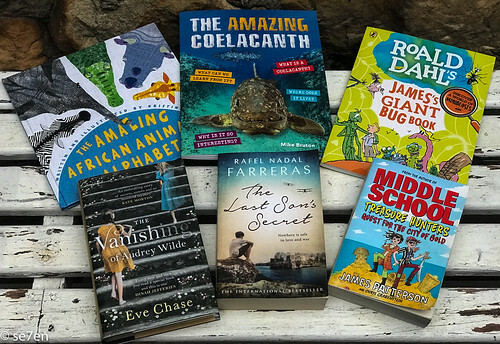 Each double page spread of facts is followed by a double page activity page… for the project loving kid, this is a piece of heaven: how to make a bug hotel, a worm farm, a butterfly feeder and so many many more. Did you know, for instance that Queen Ants can live up to thirty years? Did you know that woodlice have seven pairs of legs? Did you know that wasps make their nests from paper? They chew up wood and then spit it out as paper. And there are plenty more fun facts in this book, dozens and dozens of them. 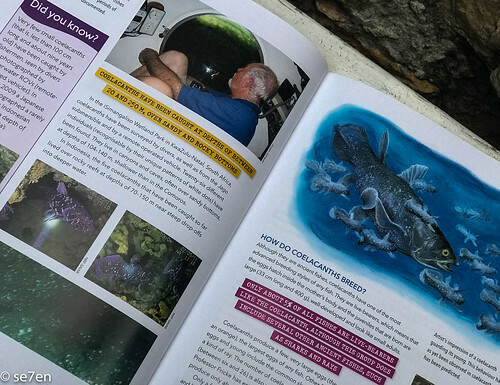 The Amazing Coelacanth by Mike Bruton: A couple of months ago we posted a review of a book about the Coelacanth a wonderful, richly illustrated book, the Annotated Four Legs, the updated story of the coelacanth. 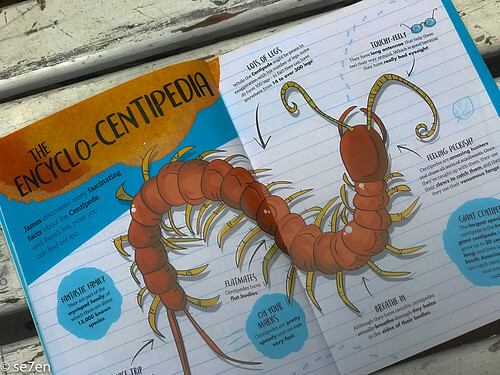 This book is aimed at middle school and younger readers, but is it really packed with amazing facts, photographs and illustrations… this book has an interesting science story for science buffs, plenty of of quick environmental facts for fact lovers, and heaps of photographs, reprinted artefacts and illustrations by Bennie Krüger for the ocean lover. 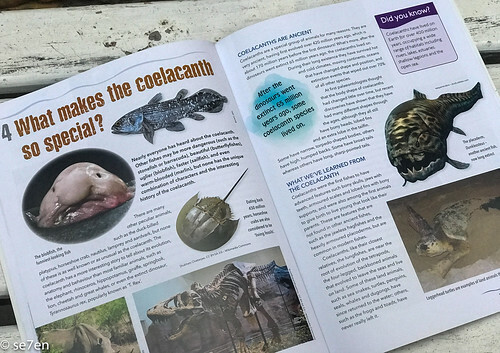 The story of the coelacanth is an interesting one, they were thought to be extinct and were only known by their fossil record, until one was hauled ashore in a fishing net off the coast of South Africa in 1939. Turns out they are far from extinct and there are distinct colonies of them around the world. They are a research scientists dream, exiting research at the bottom of the ocean… tons of details to discover throughout the 64 pages of this large scale book. There are information boxes packed with Coelacanth Secrets throughout this book. In fact this book is a mine of information on many marine themes, not just the Coelacanth. Where do they live? How do they swim? What do they eat? And hundreds of other questions like these are answered in this book. It is a veritable feast of information for folk of all ages, who like to read their facts in small bites. We really enjoyed this book, it comes with a highly recommended badge of honour on it from the my gang. Treasure Hunters Quest for the Lost City of Gold by James Patterson and Chris Grabenstein, illustrated by Juliana Neufield: The first in a new series by the authors of the hugely popular Middle School Series and just as richly illustrated, which means that even though it looks like a big fat book, it is actual fairly easy reading and a great confidence boost for someone who is launching their reading career. This has to be the first epic (364 pages) that my youngest has tried and is the perfect “beginner chapter book” for a wanna be pirate… the fact that it has Treasure in the title and on the cover might have had quite a bit to do with his decision to read it, not to mention one of the first spreads contains a map of the world. The story is about four kids, the Kidds, who live on a vessel with their parents and travel the world looking for lost treasures. Well that is until their mother is kidnapped and their father falls overboard during a storm. The hunt is on to find their missing parents… The book has loads of adventures, wild animals and baddies… tons of baddies, in fact. The children have to trick their way through hurdles of one kind or another, confound their enemies and basically and have to work a number of dangerous situations. I would recommend this book for middle graders, and especially middle grade reluctant readers. I would say slightly older than Hood 8, who was simply fulfilling his pirateering heart, some of the feisty attitude and so on went way over his head. But he enjoyed it and is proud to say that he has read it!!! The Last Son’s Secret by Rafel Nadal Farreras: If you like a grand saga set between the World Wars… then look no further. Set amongst the olive groves of the small town of Puglia in Southern Italy, at the end of World War I. I know, “What kind of saga begins at the end of a war?” This one does and there is a good reason for that. The town has been battered by the war with tragedy after tragedy striking the men folk but there is hope in the two youngsters, Vitantonio and Giovanna, whose father’s were best friends and their mother’s through the trial of grief are left to raise them. The thing is Vitantonio is the last son in the Palmisano family to survive, and it is believed that there is a curse on the family, to avoid the curse of his family, his mother goes to extreme measures to keep him alive. Under the shadow of war, and a grieving town, Vitantonio and Giovanna have a dreamy and idillic childhood… it really is the story of two young children growing up carefree in a world overshadowed by adult trials and secrets that all families must face… but the burden of the tragedy of war continues to be almost too much to bear. Promises made to be broken and love to be lost at almost every turn. But the love of family that endures and cannot be broken despite everything, and that is what keeps this book alive. 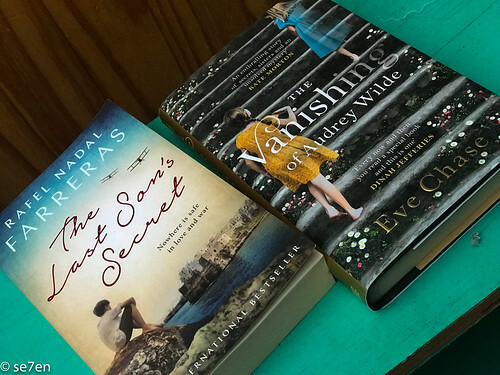 The Vanishing of Audrey Wilde by Eve Chase: Sisters, secrets and a summer in the English Countryside, it all sounds kid of dreamy. This is a story set in two time zones: The one is narrated by present day Jessie and her struggles as a new step mom, hoping to pull their family together with a move to the country. And the other, 15 year old Margot and her collection of sisters battling to come to terms with the disappearance of their cousin from the family mansion in the 1950’s. It is of course Applecote Manor that holds all the secrets and that keeps us reading on and on, we have to know what happened to Audrey and why the family fell apart. While the Wilde sisters appear to be having a carefree coming of age summer, there is this shadow, a tangible presence of Audrey lingering on… Audrey’s mother, aunt Sylvia does some extremely strange things, and seems more than a little broken by the disappearance of her daughter, understandably so. Meanwhile, on moving into the manor, Jessie’s stepdaughter, Bella, who is still mourning the loss of her own mother, also appears to have fallen under the shadow of Audrey. The theme that weaves the two stories together is Applecote Manor and of course the mystery, “What happened to Audrey?” I found this book very hard to get into, I liked each story but it took a while for them to blend together… and then I became compelled, I had to read on… I also had to know what really happened to Audrey. It is well worth pushing through the first couple of chapters to discover a book that you just can’t put down, and to pursue the mystery that is The Vanishing of Audrey Wilde. You can meet the author on her website here.